Bat Sarah Press did a fantastic job of translating our ketubah vision into a beautiful and personalized work of art. She was flexible and checked in with us throughout the process to make sure that what she created matched up with what we had in mind. 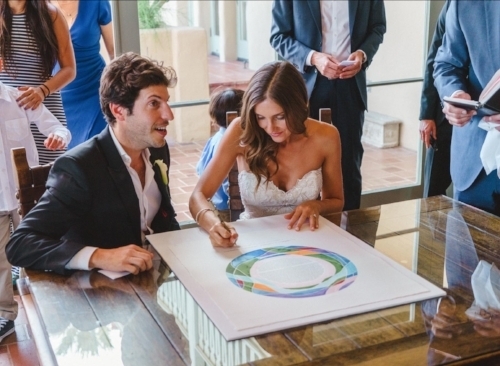 We received many compliments from our wedding guests on the ketubah and are very happy with how it turned out! Stef and Margaret at their ketubah signing, Brooklyn, NY 2018. Rachel helped us every step of the way to come up with an idea we love. She was informative and answered all our questions throughout the process. All of our family and guests loved it and we can not wait to hang it in our home! Our experience with Bat Sarah Press was phenomenal. Rachel's collaborative and creative nature is unparalled and made our journey truly unique. Rachel was able to listen to our vision and goals for our marriage create a beautiful ketubah that reminds my husband and me of our marriage journey. It was a beautiful and remarkable experience. 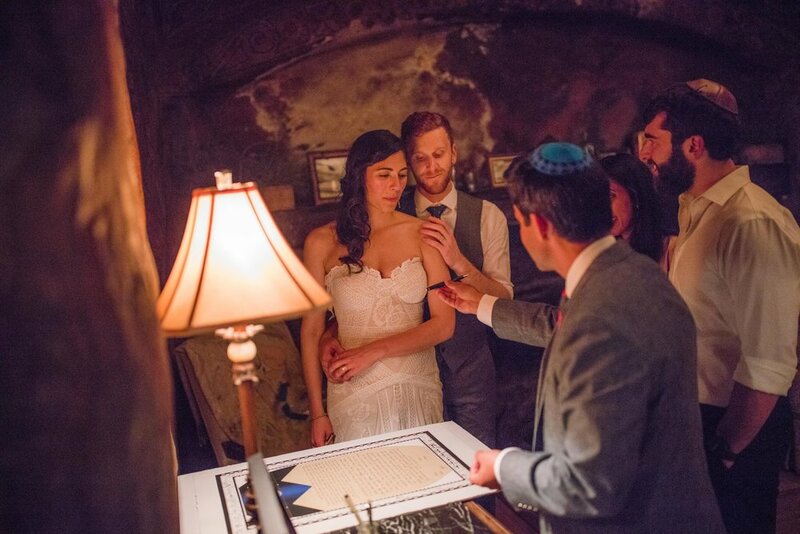 Rachel and John's Ketubah signing ceremony, Chicago, IL 2016. The process with Rachel was easy, fun, and insightful. We loved her creativity and guidance through out the whole process, as we didn’t know what we were doing, or what to choose! Her passion and love for her work shows throughout. We are thrilled with our ketubah and can’t wait to find the perfect spot to display it. I love that this will be in our home(s) forever, not only as a piece of artwork, but a constant reminder of that day and the love we share together as a Jewish couple. "The custom print and gematria print we ordered are BEAUTIFUL! Bat Sarah Press did such a great job bringing this vision to life. We are really happy with how they turned out and appreciate Rachel's patience throughout the process." "I couldn't be happier with the end result..."
It was such a pleasure to work with Rachel at Bat Sarah Press. The whole process, from my first inquiry to receiving a beautiful Gematria print, was easy and effortless. I especially appreciated Rachel's effort to inform me about the history and cultural significance of the Gematria as well as the careful thought and research she put into the making of the piece itself. I couldn't be happier with the end result and can't wait to gift it to my friends who are new parents in South Africa! Carly and Michael's ketubah signing ceremony with family and friends in cincinnati, ohio. Photos by Laura Leppert Photography, 2016. Darren and Rachel, San diego, California, 2017.